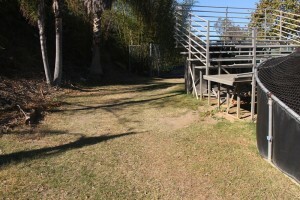 The proposed master plan for the West LA Department of Veterans Affairs fails to include 2007 and 2010 VA studies confirming high radiation and chemicals in its biomedical nuclear dump partially under a dog park. The VA had ordered and paid for the studies. Left out of the VA master plan, which closed public comment December 7 and will be finalized in early 2016, was the VA’s findings of high Radium-226, Radium-228, Uranium-238, Bismuth-214 and other radionuclides in the dump’s groundwater, which has flowed offsite at levels requiring notification of water authorities. The master plan envisions a future neighborhood at the current location of the now fenced off dump, yet the 889-page document did not include information about the chemicals the VA found at the large site such as carbon disulfide, 2-butanone, acetone and toluene. 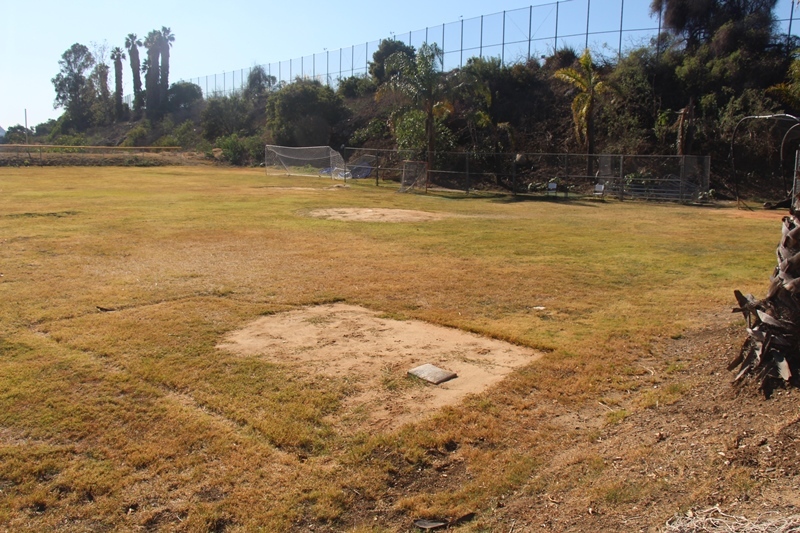 There is no mention in the master plan of whether Brentwood School was informed that its southernmost athletic field was found to have extremely high levels of chloroform and benzene in gas rising up from the dirt that kids have been sliding in for years. The 2015 VA master plan is the result of a successful lawsuit to re-focus the West LA VA on the veterans, especially homeless ones, instead of renting off the land to places like Brentwood School, which is petitioning to continue leasing the land at rock bottom rates. The $ million VA dump study, prompted in 2007 by an EnviroReporter.com investigation begun in 2001, proceeded in two phases in 2007 and in 2010, when Phase II results really started taking off as the testers drilled, dug, sniffed and sampled. Even ignoring obvious places of dumping, and a slew of veterans’ tombstones tossed into the dump, the lab results were astonishing. The report showed that Radium-226 (Ra-226) and Radium-228 (Ra-228) in dump groundwater exceeded California’s Maximum Contaminant Level (MCL) for drinking water by 60.6 percent. The VA was required to notify state water authorities of the MCL violation as the VA’s groundwater has beneficial users and is protected at the source. 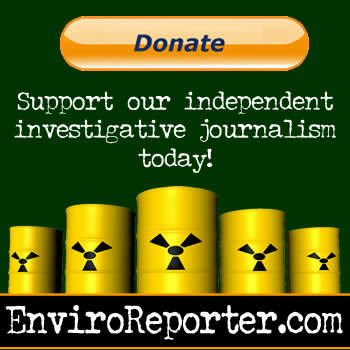 EnviroReporter.com could find no evidence that it did. The VA didn’t include its own pollution-revealing reports in the master plan even though they’re available online (Executive Summary, Volumes 1, 2 and 3) but hidden on the West LA VA’s website. 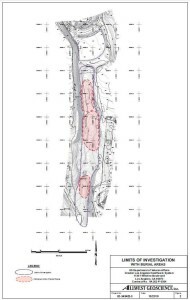 The proposed master plan also has nothing of the VA’s March 2, 2007 Phase I Final Radiological Inspection Report which EnviroReporter.com reported on and analyzed. That the VA thought it could pull off this dump disappearing act with the publicity it has already garnered is puzzling. The dump has the potential to derail the master plan, because the plan has suppressed crucial environmental information about a hazardous waste site leaking radiation and chemicals. The draft final 2015 master plan says that it must adhere to the National Environmental Policy Act (NEPA). “Achieve the fullest possible use of the environment, without degradation, or undesirable and unintended consequences,” dictates NEPA in the master plan. Considering what is in the dump, the VA may find itself being forced to fully excavate and remediate the site whether it wants to or not. Otherwise, it may be sued into the next century for unleashing “undesirable and unintended consequences” on excavators, construction workers, Brentwood residents, dog park users and veterans themselves. The last master plan by the George W. Bush Administration to build out the VA in a private partnership called CARES worth $4 billion crashed and burned, in part due to EnviroReporter.com’s dump revelations. The difference now is that extensive reports on the dump’s contents are available, information that should have been included in any discussion regarding development of the VA’s 388-acre spread. This time around, cover-ups, goo and toxic gas may crash the latest master plan even though there are many worthwhile aspects to it. Delays and further obfuscations could render a huge area of the VA unusable until it is painstakingly excavated and remediated. The losers, unfortunately, will be the veterans. The covered up Phase II report is a toxics nightmare. It shows the Brentwood nuclear dump to be worse than EnviroReporter.com ever could have estimated or imagined after Phase I.
Bismuth-214 (Bi-214), with a half-life of just 19.9 minutes making it extremely dangerous, was found in VA dump survey well “MW2” at levels over 5.6 times higher than Bi-214 found in the groundwater of Area IV at the Santa Susana Field Laboratory (SSFL) in 2011. In other words, Brentwood’s nuclear dump’s groundwater in 2009 was hotter with Bi-214 than Area IV of SSFL where three partial nuclear meltdowns occurred. Thallium-208 was found in VA dump groundwater 47.4 percent higher than at Area IV, which is undergoing a radiological and chemical cleanup costing several hundred million dollars. The radiation average of 22 tests of VA water for Uranium-238 was 44.4 percent over Area IV levels. Tritium (H-3) is the most prevalent radionuclide in the Brentwood dump as EnviroReporter.com exposed in Real Hot Property May 18, 2006. The 2010 Phase II report, replete with maps and illustrations, confirms just how much of a problem this “heavy water” is at the dump. The VA’s testing contractors, Corona, California-based Allwest Geoscience, returned to pull more groundwater August 16, 2010 and the tritium topped out at 52.5 pCi/L or well over five times what normal background levels should be in the dump. That means all those containers of tritium tossed into the dump are leaking into the groundwater. Allwest Geoscience, while not testing the mysterious mounds pointed out by EnviroReporter.com in December 2006, nevertheless was adequately detailed when it came to the describing the dump’s tritium. 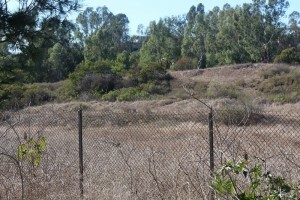 Not only did Allwest Geoscience confirm the dump’s existence, its 2010 report mapped out the exact location of three of the main dumping areas in an arroyo between the VA’s MacArthur Field and the City of Los Angeles-run Barrington Recreational Center with its athletic fields and dog park. Even armed with this knowledge for half a decade, the VA has yet to turn over a spadesful of dirt to dig out and haul away the dump’s radiation and chemicals. When Wojo was informed that no cleanup of the Brentwood nuclear waste dump had happened since the VA’s $ million testing, she was angry. Wojo will not be pleased to find out that the VA’s 2008, 2009 and 2010 Phase II nuke dump testing found chemicals in the groundwater and soil vapor that even EnviroReporter.com did not anticipate. These chemicals indicate that the contamination ranges from Brentwood School’s lower athletic field at the northern end of the dump down through the arroyo past and under the athletic fields and dog park all the way to it’s southern terminus by a drain near Brentwood condominiums. 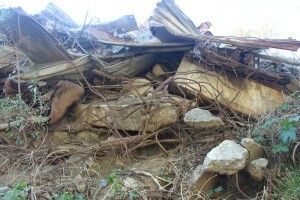 It is a huge area with tons of rubble dumped there as well. Toxic solvent 2-butanone tested at nearly four time’s normal in VA dump water in late 2008. Another solvent acetone tested at over 19 times the state average groundwater level in the autumn of 2010. The volatile organic compound (VOC) carbon disulfide tested 4.4 times the state average with another VOC toluene registering 16.9 times California’s average groundwater concentration. One of the most shocking VA dump test findings was the amount of chloroform gas coming out of the soil of Brentwood School’s southern athletic field. 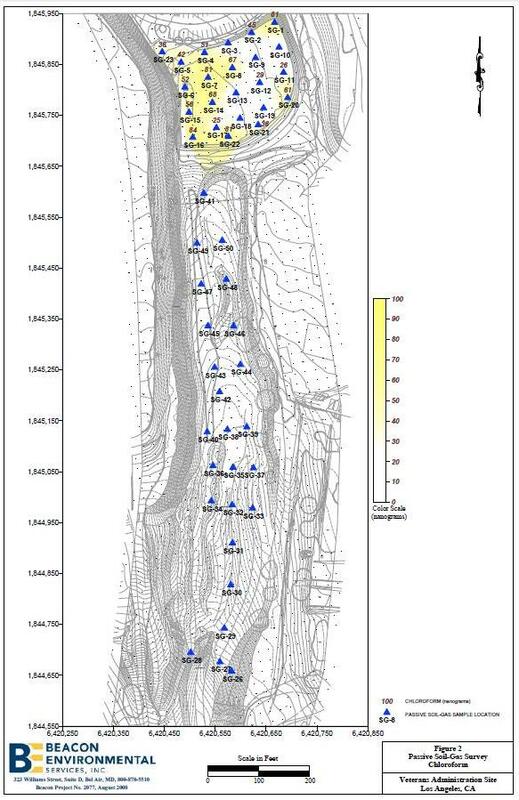 The VA report’s map of the chloroform VOC detections show it to be nearly exclusive to the field area suggesting that long-ago dumped lab waste containing chloroform is underneath that VA land that was leased to the school for many years and generations of school kids trodding the turf. The Brentwood School field is equipped and laid out for soccer and baseball. Directly to the west of the baseball diamond along the first base side, behind a small stands structure for folks to sit and watch, is a wall of rubble standing three stories high bulging with rebar, concrete and debris. This thick layer of rubble is also part of the dump and forms the base of the Barrington Recreational Center’s northern athletic field above. VA contractors set soil vapor samplers onto the Brentwood School athletic field July 9 and 10, 2008 which were retrieved July 23 and 24 and sent sealed to a lab for analysis. “Chloroform was detected in seventeen (17) passive soil gas samples at masses ranging from 25 ųg to 84 μg,” the report reads. A map of the Brentwood School athletic field accompanies the data and is colored a solid yellow indicating high chloroform gas concentrations. That range can be compared to the EPA’s Preliminary Remediation Goal (PRG) standards that limit a toxin’s concentration to a level low enough that only one in a million people will get a fatal cancer from it. PRGs have been developed by EPA for many, but not all, chemicals and radionuclides in water, soil and gas, depending on the substance and the scenario. The Brentwood School athletic field gas readings are extreme. It appears that the chloroform VOC readings are between 301 to 1,012 times the EPA’s PRG. There is no mention of this in the VA’s 2015 master plan. There are also no warning signs around the athletic field alerting users as to the gas in the grass. Another VOC was detected in the same weeks-long gas sampling of the athletic field, benzene. Samplers were deployed at the same time the chloroform testing began. Two came back positive for benzene gas at 120 to 132 times the EPA’s PRG near the entrance to the field by an immaculately gardened parking lot and spotless drive. 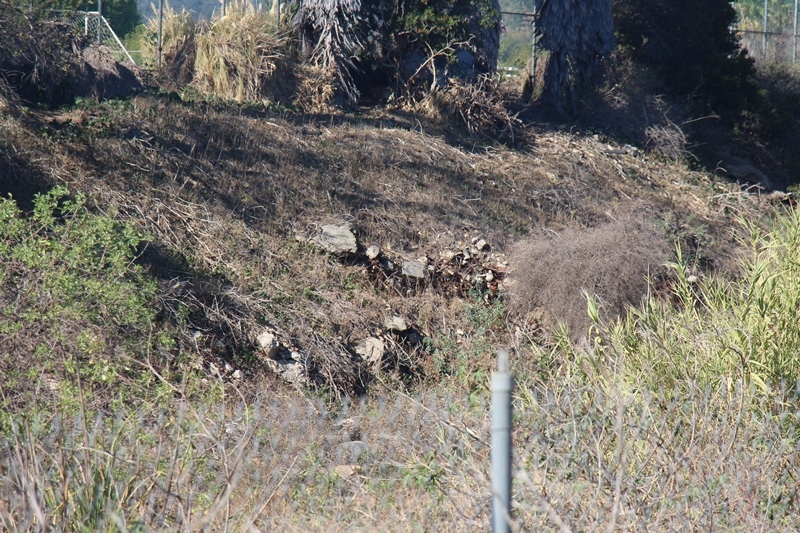 Tons of dump rubble falling down the adjacent hill is hidden discreetly with a stand of giant bamboo. The dump has been designed out of sight for the parent motoring by oft times in Roll Royces at this exclusive school which gave rise to the pop band Maroon 5. A December 9, 2009 sampling of VA groundwater at the other end of the dump found benzene present that exceeded California’s Public Health Goal by over 2.5 times. There is benzene in, under and gassing above the VA’s Brentwood dump, from end to end in some of the most valuable land west of the Mississippi River. Getting the goo out likely means taking those chloroform readings seriously and digging out the leaking containers of the noxious chemical to stop the leaking and resultant VOC gasses wafting to the surface. It also means removing countless tons of rubble like the wall of wreckage looming over Brentwood School’s southern athletic field and all down the west side of the arroyo adjacent MacArthur Field. 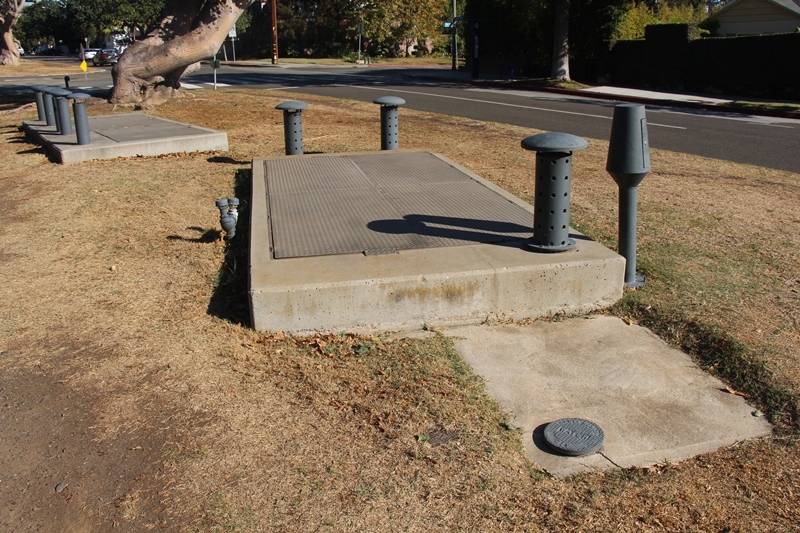 The acronym stands for the Los Angeles Regional Water Quality Control Board which the VA should have informed of the high total radium in the dump groundwater. This passage citing LARWQCB confirms awareness of the law, making the decision to not inform the water board of the hot water suspect. 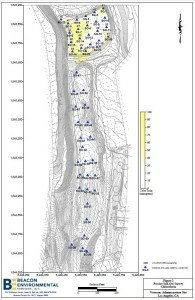 EnviroReporter.com has found evidence that suggests the VA’s nuclear dump may in fact already be impacting Santa Monica’s groundwater well to the southwest of the dump. 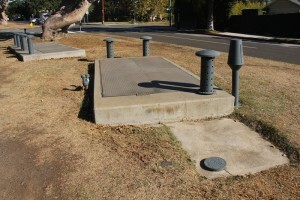 The well exists in the median of San Vicente Boulevard and 19th Street with water that is hot enough with uranium that Santa Monica Public Works considered installing a $332,000 per year treatment system to just to clean the uranium, not even counting the yearly costs of disposing the resultant radioactive brine. Not just any residential neighborhood either. According to a January 27, 2015 Curbed Los Angeles, the area ranked number one in expensive homes. The median cost was $3.1 million in 2014, radioactive groundwater included, no charge. The Santa Monica well is just 2.4 miles from the VA well, which was found to contain Uranium-238 (Ur-238) in 2009 in dump groundwater at 0.820 pCi/L. The VA’s hot Ur-238 groundwater, uphill from Santa Monica and in the same range as the downgradient San Vicente Boulevard well, registers 44.4 percent hotter than the Ur-238 under SSFL’s grossly polluted Area IV. Greater Los Angeles’ most expensive haunts have that added cache that their groundwater’s uranium is higher than one of the most polluted places in the country. To be sure, the VA’s cover-up of its 2010 dump toxics report in its 2015 master plan was a long shot considering that people were watching all these years, people like Dr. Bennett Ramberg, a nationally and internationally read columnist on nuclear matters and long-experienced with the Brentwood nuclear dump. Indeed, where is the prudence in not telling the water board of the high groundwater radium when legally required to? Or the prudence of not telling Brentwood School that its southern baseball/soccer field has a chloroform and benzene gas problem? Or the prudence that keeps two phases of VA nuclear dump testing from being included in the very same VA’s master plan? EnviroReporter.com is prudent enough to know that the West LA VA could claim that they never read the article you’re reading now once it is published. It could claim that it never knew that it forgot to include that pesky nuclear dump information, and what to do about it, in the new master plan. That’s why on December 7, EnviroReporter.com submitted a public comment with much of what is included here, and got a receipt to prove it. The VA cannot escape facing the fact that a toxic waste dump has to be dealt with before any master plan can be successfully implemented. At the very least, they – and the public – have the right to be warned of the peril of playing with polluted land. The VA’s new master plan refers to the dump area in a variety of ways which serves to obscure what would actually happen to the area if the plan is implemented. The dump is shaded in one illustration delineating “Existing Green Space” and in another drawing “Parkland.” One map calls it “Potential Expansion Neighborhood” and yet another “Macarthur Neighborhood” [sic]. When the dump is partially described as the “Arroyo,” VA’s hired planning guns slip into lawyer-speak and fuzz up the plan for the waste site even more. 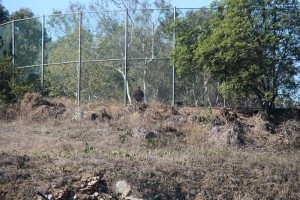 This suggests to EnviroReporter.com that the master plan creators may know exactly what the real deal is with the dump and deliberately left it out of the master plan. That means landscaping, grading, digging and all the activities that encompass creating a “circulation spine in this scheme.” Will the gardeners and equipment operators undertaking these activities know what’s in and under the waste site land that they’re working on? Will the construction workers building the “expansion neighborhood” be forewarned of the radioactive and chemical contaminants in containers and barrels that are buried at the site along with carcasses of thousands of nuked lab animals including dogs, cats and rabbits? The failure to include this information threatens the master plan’s implementation and raises serious questions as to why the VA would quash two of its own reports that show if developed, the dump could unleash radioactive and chemical contamination, expose workers, nearby residents, dog park users, and veterans as well as leave the land a toxic waste dump designed as a park. Perhaps the VA thinks this is a good thing as it would save the scandalously-run place a boatload of money. The VA should have known since late 2010 that the deadly radionucluides Radium-226, Radium-228, Bismuth-214, Thallium-208, Tritium and Uranium-238 were leaking from the dump into the groundwater at levels that demanded action. VA should have also known that benzene was found in soil vapor in a Brentwood School athletic field on the north end of the dump with the same contaminant fouling groundwater at the southern end of the waste site meaning the entire site is befouled. VA should have told Brentwood School of the chloroform vapor readings at the school’s southern athletic field. Most importantly, VA should have included these unearthed reports in the master plan because one of the first rules of planning should be not to do it on top of a confirmed biomedical nuclear and chemical waste site, especially one as large and contaminated as the Brentwood dump. Short of cleaning it up entirely to stop the leaking barrels of radioactive goo from continuing to nuke Los Angeles and Santa Monica groundwater, VA could at least let people know how polluted the place is. Dr. Bennett Ramberg would agree with that sentiment. The longtime VA nuke dump observer figures if the VA is going to cover-up the waste site, they should just leave it as it is, literally covered up. This 15 minute video brings up a lot of independent research on the biological effects radioactive Tritium releases. Tritium is something to be very concerned about. The video also expressed a public concern over children visiting the Lawrence Hall of Science to exposure to tritium emissions from the Lawrence Berkeley National Laboratory’s (LBNL) National Tritium Labeling Facility. I’m interested in the potentially lethal combination of the tritium and the brush, as someone who used to live in the apartments and shop in the little stores just west of the site, long, long ago. If that brush on Federal property caught fire, who would respond? Does the V.A. have a “fire department” on its hospital property which would put out the fire, or would the L.A. City Fire Deparment (1) be the only party to respond or (2) assist a Federal fire house crew? It seems to me that any Federal or L.A. would be interested in protecting their firefighters from the tritium. Perhaps a word to the union might do. It’s absolutely mind-boggling that this is occurring smack in the middle of West Los Angeles. Hello, Angelenos — this is your own backyard! How are there NOT street demonstrations blocking Wilshire Blvd? What the hell does it take to get people to defend themselves from environmental pollution? 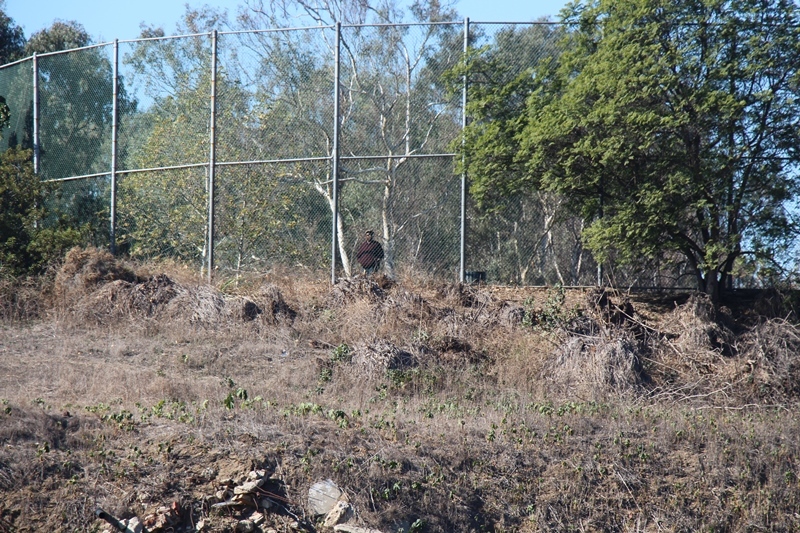 @All: Looking at Dec. 2, 2006 photos of the mysterious mounds in the West LA VA Brentwood dump, we compared them to photos taken Dec. 16, 2015. You can see that mounds are still there in 2015 even though they’re covered in brush. 1. The mounds are still there, mounds we think are the result of dumping as lab tubing was sticking out of one of them. 2. The mounds are not on the topography maps of the 2010 VA dump report meaning they are unnatural, i.e. they are from something being buried there (and not buried very well unless the dumpers wanted to make the mounds look like graves). 3. These mounds have never been excavated or tested even with $1 million spent on doing just that in the dump, dog park, Barrington Rec Center and Brentwood School. As we have previously reported, the testing deliberately avoided the most obvious parts of the dump and tested mostly fill in Phase I. 5. The brush is overgrown and chock full of tritium. H-3 or “heavy water” is a beta-emitting radionuclide which is dangerous when ingested, absorbed through the skin or inhaled. Should that brush catch fire for any reason (cigarette, spark from equipment, or something worse), then it will result in radioactive smoke that could impact thousands of people in every direction as well as spread tritium contamination wherever the smoke goes. 6. “Transpired plant water was only analyzed for Tritium,” meaning there are likely other dump radionuclides and chemicals in the dead grass and brush. 7. We’ve seen the VA cut the dump brush once before in 2006 and we have one suggestion should it see fit remedy this dangerous situation: make sure the folks cutting the brush all have adequate particulate respirators and full eye protection against dust. They did not nine years ago. 8. The VA will probably do nothing so it may be up to veterans and residents around the dump to demand that the brush be cut down. Failing that, should the dump catch fire, and you are within whiffing distance, close those windows and fire up the HEPA filter air cleaning machines. The arroyo area on the north side of the property was previously used as a waste burial site in the 1950s and 1960s. While the Arroyo (a closed site) [clearly inferring that it was to remain that way hence why it was “deemed safe”] and the adjacent park have been subject to extensive testing over the years and have always been deemed [“deemed” is not “is”] safe to the public, low-level biomedical research waste has been found in very small, and non-harmful amounts. There have been several surveys of this area done by many government agencies and Environmental Consultants over the past couple of decades. The first survey was conducted by the Nuclear Regulatory Commission (NRC) in 1981, which they concluded the site contents were all low level biomedical waste radiation [Wow! So “all” the waste is radioactive? Great.] 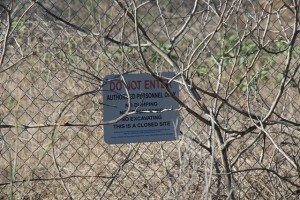 and no threat to public health, then in 1992 the Environmental Protection Agency (EPA) conducted a similar survey to access human health risk to the site and it was cited that there were no human risk due to the low levels of radioactive materials in the burial areas [IF it remained a closed, fenced off site. Fact is even that hasn’t kept it safe as our groundwater findings show]. In 2000, due to the Brentwood School project (20 acre ESA), all documents were reviewed and re-quantified by Locus Technologies Inc. and the same conclusion was found [FALSE: go look at the Locus Technologies reports yourself since we forced their release.]. These results are available on the Brentwood School’s website [No they are not]. 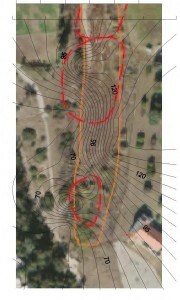 In 2007, Millennium Consultants Inc. conducted a surface survey and again re-quantified the burial area data and summarized all reports to find no hazard to the general public [Again if the site were to stay as-is.]. In 2009, AllWest Geosciences Inc. conducted core drilling in the site for radioactive and chemical hazards. All results determined that there should [That parsing is correct – “should” but not “is”] be no potential human health risks associated with buried medical waste resulting from historic medical research and disposal at the WLA property. Now why wasn’t this included in the 889-page 2015 West LA VA master plan? The failure to include this is nearly as bad as jettisoning the two VA radiation reports explored and deciphered in our exposé. More evidence that the 2015 West LA VA master plan deliberately excluded the dump information. I noticed the tiny sign on the fence in the photo above. IMO – How about… large, VERY BRIGHT, banners hanging on those fences. How many of these kinds of dumps are there worldwide? How many have actually been successfully turned into ‘Parkland’/’Green Space’? ➡ How many times were we never properly informed? A toxic legacy created by humans without regard for others or future generations. How did we let this happen? How can anyone allow it to continue? Michael Collins’ article on the V.A. Brentwood site is the most thorough and well thought out report I’ve seen in 40 years of dealing with toxic sites. I am stunned at the amount of analytical work Michael engaged in to give everyone the true picture of what is going on. Setting aside the question of whether all of the radioactive and toxic materials at the V.A. property have impacted anyone’s health, I want to point out that there are huge potential money damage claims by private individuals who are owners of apartment buildings, condominiums, homes, stores, and high rise office buildings to the extent the “witches brew” of chemicals in the ground water has flowed under those people’s real estate. It’s important to note, however, that unlike other cases involving radioactivity or toxics, the only court which may have jurisdiction for private individuals (or the City of Santa Monica) might be able to seek redress for their property damage claims is probably the United States Court of Federal Claims in Washington, D.C. As a result, no one should run out and hire a lawyer who thinks they can file money damages claims against the Federal government (V.A.) in any California state court or in the U.S. District Court for the Central District of California. Careful research has to be done on what remedies property owners have against the Federal government for polluting private land. However, the statute of limitations clock has started ticking with publication of this story, so affected property owners and the City of Santa Monica need to start thinking about whether they are going to pursue money damages from the Federal government or not. As to people who were made sick or injured by the radioactive and toxic materials, if they want to bring legal action against the Federal government (V.A.) they have to search, very carefully, for a lawyer who knows how to bring personal injury claims against the Federal government. Again, it’s not garden variety tort claim litigation for your friendly neighborhood lawyer. One of the biggest problems with America’s Federal court system is that it is virtually impossible to get an preliminary or permanent injunction or writ against a Federal agency compelling them to DO anything. So it would be a long, tough road for a member of the public to get a mandatory injunction compelling the V.A. to “clean up its mess”. The other interesting point is the potential for housing construction on the radioactively and toxic contaminated land. If the Federal government merely “ground leases” the contaminated land to a developer who will build on the land, there’s a question in my mind whether any City or County of Los Angeles can assert regulatory jurisdiction over the building of housing. The answer may be “No” if legal title to the land is kept by the Federal government. Alternatively, Federal agencies sell surplus land all the time. 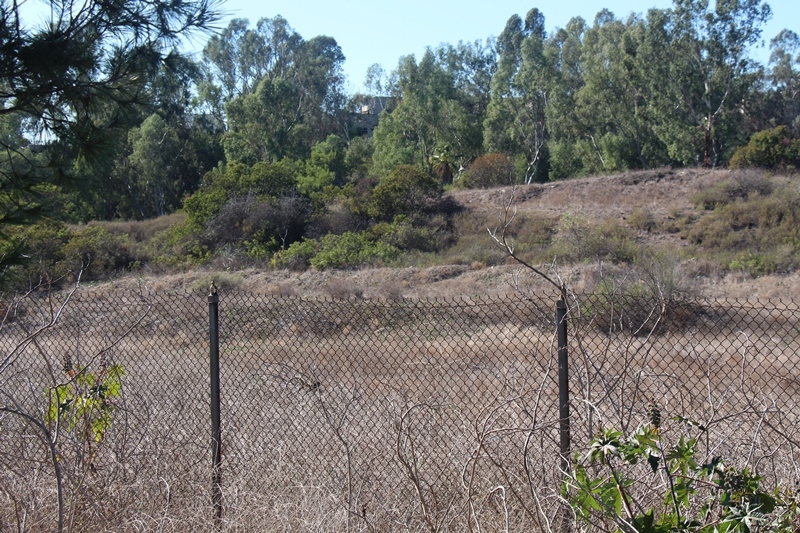 As a result, if ownership of this contaminated land is SOLD to a developer, one needs to know whether the land was ever annexed into the City of Los Angeles. If not, then jurisdiction over development would belong to Los Angeles County. California law is very deficient in requiring soil tests for radioactive materials or toxic substances on real estate “properly zoned” for housing. Most cities are so “pro-development” they are unlikely to layer-on soil testing for radioactive or toxic substances on and under the property. That sort of soil testing is different than soil testing to engineer a building’s foundation, which cities and counties do require. So given the moral deficiencies of local government officials, it’s conceivable we could end up seeing housing built on this property, despite Enviroreporter’s best efforts to make everyone aware of the truth and severity of the problem. I’ve reached the point where I’m firmly convinced every public employee and every elected decision maker in government is morally compromised by a desire to keep their jobs and be promoted. California, in particular, is the New Jersey of the West. As a result, if the Feds refuse to clean up the mess on the V.A. land, as they’ve done in so many other locations around the country where the Federal government is the polluter, the only thing which will keep people safe is “word of mouth” to “stay away”. Thanks Enviroreporter, you’ve given us the words to say and the data to back it up. @vital1: The multiplying effect is certainly a big factor here and we thank you for telling us all about it. This is an aspect that we could have gone into but the piece was already very complicated with science that demands at least an 8th grade-up education to fully get. Another factor at play in how much we reported here is all the material that we have already reported at VA Nuclear Dump during this 14 year (!) investigation. This piece does not regurgitate all the important discoveries of the investigation, obviously, but it is all here. Vital1 might be interested to know about Waxman Document 79 which documents pollutants plaguing the Brentwood School fields, including syringes, and also reports how the entire area was used as a dump for decades. Indeed, EnviroReporter.com successfully pressured former Congressman Henry Waxman (D-Los Angeles) to obtain over 5,600 pages of crucial documents, much of which can be accessed in the well-organized Waxman Veterans Administration nuke dump documents. This is required reading for anyone interested in this issue and/or attends Brentwood School (or pays for it), dog park users, veterans, Barrington Rec Park users and the people who work at the school, golf course and West LA VA. Most people would not be aware, that with so many radiological and chemical toxins being detected at this site, a toxicity multiplying effect would be in play. Biologically, one toxin plus one toxin, does not equate to double the toxicity effect. Studies show you can get a multiplying toxicity damaging effect 10 to 20 times greater. The human or animal defense systems becomes weaker, the more toxins it has to deal with. The organism becomes overloaded, dealing with too much toxic stress at once. To have knowingly allowed the exposure of large numbers of people, and particularly children, to this cocktail of toxins, is criminal! Thanks Michael and Denise for another excellent piece of investigative journalism. Great coverage. Your hard work is highly appreciated!